Complete mass of NWA 4468. History: Found in the western part of the Sahara in summer 2006 and purchased in Laâyoune by G. Hupé in July 2006. 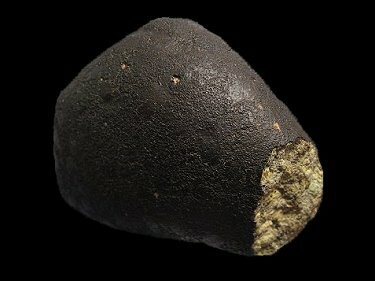 Physical characteristics: A single 675 g ellipsoidal stone, mostly coated by shiny black fusion crust, and broken at one end revealing the pale yellow-green interior. 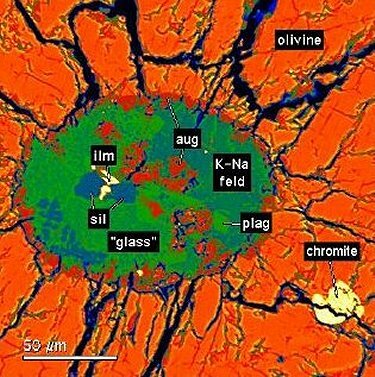 Petrography: (A. Irving and S. Kuehner, UWS) Large ovoid pyroxene oikocrysts (2–10 mm across) enclosing chadacrysts of Ti-poor chromite and olivine are set in an interstitial matrix of 35% olivine, 30% clinopyroxene, 25% maskelynite (all vol%), Ti-chromite, ilmenite, merrillite, Cl-apatite (as prisms up to 0.8 mm long), and pyrrhotite. Inclusions (up to 300 µm across) surrounded by radial shock relaxation fractures occur within matrix olivine grains; some are quenched melt inclusions and others consist mainly of maskelynite. The specimen is cross-cut by sporadic, thin, dark, glassy shock veins (Irving et al. 2007). 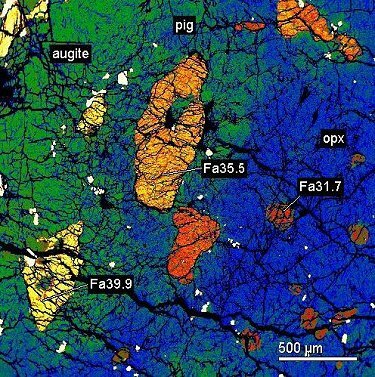 Mineral compositions and geochemistry: Pyroxene oikocrysts are zoned from orthopyroxene cores (Fs24.5Wo4.4; FeO/MnO = 35.4) with mantles of pigeonite (Fs26.3Wo6.3; FeO/MnO = 29.4) to augite rims (Fs17.9Wo33.6; FeO/MnO = 24.9). 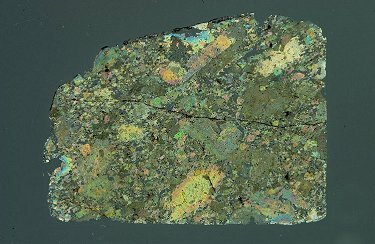 Olivine chadacrysts (as magnesian as Fa28.8) typically become progressively more ferroan from pyroxene core to rim (up to Fa39.9). Matrix olivine (Fa40.7; FeO/MnO = 50.2), matrix clinopyroxene (Fs31.3Wo8.1, Fs19.6Wo31.3), matrix maskelynite (An38.7–54Or3.9–2.3); maskelynite in inclusions within olivine is inhomogeneous and K-Na-rich (Or52.6Ab40.7An6.7). Type specimen: A total of 20.2 g and one large 3.8 × 2.8 cm thin section are on deposit at UWS. G. Hupé holds the main mass. RELATIONSHIP TO THE OTHER INCOMPATIBLE-ELEMENT-ENRICHED SHERGOTTITES. Lunar and Planetary Science XXXIX. (abs. 1851). J. G. Spray and S. Boonsue. EVIDENCE FOR PHASE TRANSFORATION-INDUCED IMPLOSION. Planetary and Space Science Centre. 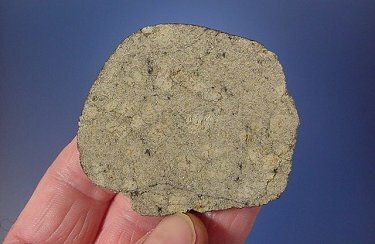 BASALTIC SHERGOTTITE NORTHWEST AFRICA 4468. (abs. 1526). Complete polished slice of NWA 4468. Thin Section image in partially Cross-Polarized Light (pyroxene and olivine colors, maskelynite gray, glass veins and chromite black).